Doom metal legends Sleep announced late last year that their long-awaited fourth LP was nearing its completion, shortly followed by a tour announcement. While the details of the album weren't made public until after this run of shows -- ahead of the album's 4/20 surprise release -- fans at Liberty Hall on April 8 got a taste of the album's themes without knowing it. The night's main event began only after the playback of a moon landing radio transmission -- the artwork of "The Sciences" features an astronaut burning one in outer space. 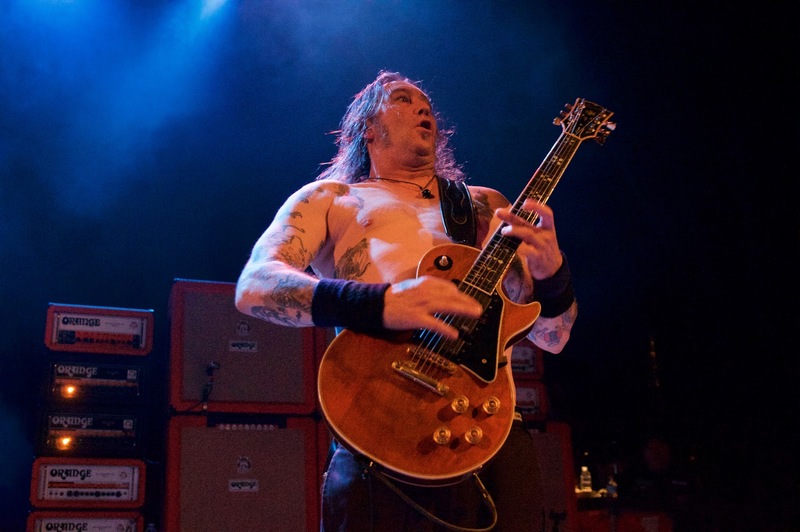 After the transmission ran its course, the members of Sleep emerged from backstage and stationed themselves behind the drum kit and in front of two massive stacks of amplifiers. Their 90-minute riff marathon was kicked off by fan favorites "Holy Mountain" and "Dragonaut." The iconic and bluesy licks of the latter spawned the most violent enthusiasm any stoner metal crowd can muster. They can't be blamed either -- they were watching an era-defining song be performed live in their town on a day they weren't sure would ever come. Sleep's live performance was in many ways like a freight train. The amount of power it took to employ their mountains of amps was enough to make the venue's chandelier flicker until it was turned off half-an-hour in. It also took a moment for the band to come to a stop after a few of bassist Al Cisneros' amps began to fail on him mid-song. After the group got chugging again, guitarist Matt Pike's shirtless shredding hardly paused again. His minimalist style of songwriting shined bright on "Holy Mountain" cut "From Beyond" late in the set. Utah band SubRosa joined Sleep as the night's lone support. Their smart soft-loud dynamics and uniquely atmospheric take on doom metal made them a choice pick. One of their final songs utilized a haunting vocal whisper and could've made for a tasteful soundtrack for a horror movie trailer. Their violinist also did an impressive amount of headbanging.